What’s Causing My Tired Legs? Tired legs that feel weak and heavy to be rooted in muscular fatigue or circulation problems. If you believe that your leg fatigue may be a circulation problem—especially if you notice varicose veins bulging from under the skin—see your doctor or a vascular specialist. If you often experience tired legs when the rest of you is wide awake, it could be time to have your cardiovascular health checked and to evaluate your muscular fitness. Tired legs can actually be a symptom of several conditions, but typically the feeling is caused by decreased blood flow from the legs back to the heart or by a gradual weakening of your leg muscles. Getting older can be blamed for both of those problems, though not always. Before we get into the causes of tired legs, let’s start with a closer look at how our legs work. 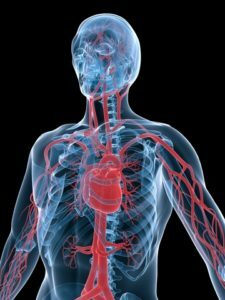 Your blood travels from the heart to your organs and muscles other tissue through a network of arteries. Blood travels through veins on its way back to your heart and lungs to receive oxygen and begin the circuitous journey again. Transporting blood from your lower legs and feet can be challenge for some people. Veins have one-way valves to keep the blood moving up to the heart. People who are inactive and go through long periods of sitting or standing have higher risks of a circulation problem called chronic venous insufficiency (CVI). Advancing age, obesity, smoking, pregnancy, varicose veins, and a blood clot in the leg (deep vein thrombosis or DVT) are all CVI risk factors. CVI can cause numerous symptoms, including tired legs. But poorly functioning veins can also cause leg swelling, new varicose veins to develop, and changes to your skin. Your legs can feel itchy and flaky. If the swelling gets too bad, tiny blood vessels called capillaries in your legs can burst, causing bruises to appear on your lower legs. If DVT is diagnosed, you are at risk of that blood clot traveling to your lungs, where it can be lodged in a pulmonary artery, affecting the health of both your lungs and your heart. If you believe that your leg fatigue may be a circulation problem—especially if you notice varicose veins bulging from under the skin—see your doctor or a vascular specialist. Varicose veins can be treated with outpatient procedures. “Varicose veins cause symptoms of swelling, pain and tired legs, and over the long run, if left unattended, some of these can even break down and cause ulceration of the skin if not treated and if they become severe,” says Jonathan Bath, MD, a vascular specialist with University of Cincinnati Health. If your tired legs are sore legs, too, you should take note of when they start to hurt. If simply walking or climbing stairs causes leg pain, but resting makes the pain disappear, you may have a condition called peripheral artery disease (PAD). It develops when the arteries in your legs narrow, due to plaque buildup. When any of your muscles aren’t getting enough oxygenated blood, they get sore until blood flow is restored or until the demand for blood diminishes with rest. But PAD may be much more than a challenge to taking a long way. It also may be a sign that you have heart disease. Plaque buildup in one artery suggests that there may be similar blockage in other arteries—including those within the heart (coronary arteries). Risk factors for heart disease include high cholesterol, high blood pressure, diabetes, kidney disease, obesity, smoking, a sedentary lifestyle, and a family history of heart problems. If you have no other symptoms than tired legs, take that as a cue to have a physical if you haven’t had one lately. And be sure to share your symptoms with your doctor about your tired legs. The blood pressure in your lower leg can be checked. And imaging tests, such as ultrasound, can reveal clues about how blood is flowing in your legs’ arteries and veins. If blood flow isn’t the issue, your tired legs may be due to tired leg muscles. The clinical term for a weakening of muscle strength is sarcopenia, and it’s actually something we all experience as we age. Starting sometime in your 30s, you begin to lose muscle mass. Bone density also declines with age. And in women, the hormonal changes triggered by menopause make bones even more likely to fracture in a fall. Both women and men also see an acceleration in muscle mass loss and muscle weakening after age 50. Even if you’re not planning a career as a senior bodybuilder, losing muscle mass should be a concern. Tired, weak muscles can limit your ability to be active and enjoy such activities as tennis, dancing, hiking, and much more. Growing weaker can also affect your daily functioning and independence. Fortunately, sarcopenia and bone density loss can often be countered by simple weight-bearing exercises. Walking (especially up and down stairs) and doing push-ups or other resistance exercises can help you maintain muscle mass. Though it may seem counterintuitive, your legs can feel more tired after no activity than after a good workout. A sedentary lifestyle only helps the normal age-related loss of muscle mass along. Physical activity boosts the movement of blood, oxygen and glucose to your leg muscles. Forcing your muscles really has some anti-aging benefits. Even heart failure patients can lose some of that tired legs feeling with exercise. Having a weakened heart can make it difficult to stay active. The reduced pumping action resulting from heart failure means less blood flow into the legs, increasing feelings of fatigue and weakness. However, a study by doctors at the University of Leeds in the UK suggests that heart failure specialists work with their patients not just on preserving heart health, but on improving their leg strength, too. This can be done with careful warm-up activity before any type of exercise involving the legs. If you have tried on your own to revitalize your tired legs with exercise, rest, or any other possible remedy and notice that they’re still dragging, see a doctor soon. It may not seem like a serious issue now, but if you and your doctor can diagnose the problem, you may be able to start taking (lively!) steps toward feeling better very soon. Varicose Vein Treatment: Which Approach Is Best for You? Periodic Limb Movement Disorder: What Does It Mean? aging, artery disease, back pain, blood clot, blood clots, blood pressure, bone, bone density, bone density loss, cardiovascular, cardiovascular health, cholesterol, cholesterol high, chronic heart failure, coronary, coronary arteries, cramps, deep vein thrombosis, diabetes, exercise, fitness, glucose, health, heart disease, heart disease risk, heart disease risk factors, heart failure, heart health, heart problems, high blood pressure, high cholesterol, leg pain, long periods, muscle, muscle mass, obesity, pain, pains, periodic limb movement disorder, peripheral artery disease, physical activity, plaque buildup, restless leg syndrome, restless leg syndrome treatment, sedentary lifestyle, skin, smoking, strength, thrombosis, tired, tired legs, varicose veins, what causes leg cramps, your lungs. I thought you might be interested in this article on https://universityhealthnews.com: What's Causing My Tired Legs?